The PSA AK-P GF3 is designed from the ground up to be a new standard in AK-47 pistols, utilizing all new precision manufactured parts. Thoroughly tested in development, we tortured tested to 10,000 rounds to ensure a quality product. Not to be satisfied with just a good AK-47, we kept improving and now are proud to announce our PSA AK-P Gen3 Hammer Forged (GF3) pistol with a hammer forged bolt, carrier, and front trunnion. The 4150 barrel is nitride treated for accuracy and durability and is pressed into a new hammer forged front trunnion to ensure the longevity AK-47s are known for. The hardened steel 1mm receiver features a mil-spec style single hook trigger, and side rail mount. The front trunnion and bolt carrier are engraved with GF3 to designate the GF3 hammer forged model. The pistol is finished with a Magpul polymer handguard, SB Tactical SBA3 Pistol Brace, and Magpul AK-47 polymer grip; Rifle ships with 30 round Magpul magazine (where allowed by law). The top Picatinny railed dust cover was designed so most common low mount red dot optics will co-witness with the front and rear sight. High mount red dot optics will not co-witness with the AK-P sights. Please see pictures below: (Optics shown on pictures is for references only; not included). The Picatinny dust cover has a flare on the right side designed to stop the safety selector from riding above the dust cover. The included M4 adapter with SBA3 can be removed and replaced with the soon to be released triangle side folding brace and mounting mechanism. They are designed to be interchangeable. We will be selling the M4 with SBA3 assembly and the Triangle with mounting device separately to be used on other firearms in the coming months. We will have the triangle side-folder brace/ mounting mechanism model in about 2-3 months. Pistols must be shipped to a valid, current Federal Firearms Licensee (FFL). Please have the shipping address of your preferred FFL before placing your order. You will need the FFL information to complete the order. It is the purchaser's responsibility to be aware of the laws in their state regarding high capacity sporting pistols. What is the difference between this and the KS 47 pistol? BEST ANSWER: If you haven’t done the tiniest bit of reading or even of watching a video to figure that question out it’s unlikely that either the AK-P or the KS47 are ‘your speed.’ Reading is actually a super power, it transforms unknowledgeable people into slightly more knowledgeable selves. That's the best reply I've read all year. One is based on the tradition AK platform the other is based on the AR platform. Its worth noting they both take the same AK mag. The KS47 would theoretically be more accurate but there are so many variables it’s hard to say, it could vary gun to gun. Whoever is replying to these questions ? What zenit rail is compatible with this pistol? BEST ANSWER: Do us a favor and look at a picture of this pistol and tell me if ANY rail will go on it, and get back to us. I looked at the picture? 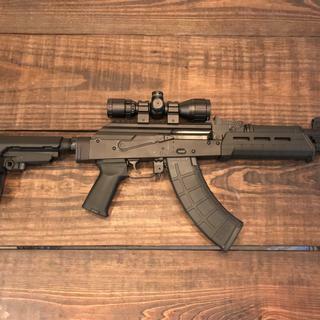 It looks like a most rails would be compatible, just by looking, and as not an SME with AKs. How about you take your negativity somewhere else? Ok, so you didn't look at the picture. There's no rail mount on this pistol. What are you talking about? I'm pretty sure I see MLOK slots right there on the side, and how do you know that a midwest or any other rail won't slide in place of it? How can you tell it is just a totally different size? Looking at Zenit Hand guards only the SBR. "short barreled rifle" length will work without mods. The front sight is fixed. Is the krink brake removable and if so what is the thread pitch ? BEST ANSWER: Why don’t you do all of us a favor and READ THE SPECS ABOVE. Shazaaaam! Like magic the answer is there. Would this work ok with a 4-piece flash hider? BEST ANSWER: If your muzzle device uses the same thread size as described in the description, then it would fit. The real problem would be if it cycles. In the 2 minute video that you haven’t watched, they explain how they put that muzzle break on there for added pressure to ensure the weapon cycles. Yes, I wasn't concerned with thread pitch. I asked specifically due to cycling concerns after watching the video. Was hoping someone with experience or PSA could answer whether the booster is a requirement for reliable cycling. 1) The krinkov break was developed for this specific piston/gas set up. 2) your 4-piece flash hider was developed for something else. 3) get an adjustable gas block. He’s asking due to the fact the guy in the video stated they put the booster on there so it would reliably cycle. I and others want to know if putting a different muzzle device on there will affect performance. When will they be stock? BEST ANSWER: My magic 8-ball said next week. What is the thread pitch under the muzzle device and can the muzzle device be changed? BEST ANSWER: Not big on all that fancy readin’ are you? Specs. Listed above. Video posted above. All answers in places you’re too lazy to bother looking, even when they’re right in front of you. Why is this gun no longer available to Michigan residents? How fast do you guys manufacture these.? When will the railed hangaurd version be available? Those are M-Lok slots for rails on the handguards already... just add rails at your convenience. Would a Krinkov style gas tube from ultimak work with this? What is the estimated release date on that Triangle brace? Are the barrel threads checked for concentric to bore? Will the Ulti-mak railed gas tube fit? What is the length of the gas tube? What is the overall length of the weapon? BEST ANSWER: With the mizzle device attached, 31.5" with the brace extended, 29" with it collapsed. Does psa zero the sites and if so at what distance? BEST ANSWER: Mine was zeroed at 50 yds out of the box. If i want to SBR this pistol, is it capable of having the M4 adapter removed and accepting a standard Kalash AKM stock? Will this be compatible with the Franklin Armory binary trigger or would the stop on the top rail prevent a 3 position lever from functioning correctly? BEST ANSWER: Yes, but only Glock 47 magazines. It is chambered for 7.62x39. Can you get one with a folding brace? BEST ANSWER: PSA will be releasing a new triangle folding brace that should be a simple swap with the brace that comes with the AK-P. It will have compatibility with the mounting bracket that currently ships with this gun. When are these expected to be in stock? Is it possible for us to know what the rear trunnion is? BEST ANSWER: Standard single top tang, will accept wood furniture easily. Thanks for the reply. I mean to be a bit more descriptive on my question. I was hoping to know if it was cast, forged, or milled. I’m figuring from the lack of information in the description it was either cast or milled. Any chance you'd be able to buy just the pistol no brace? Does this have last shot hold open? BEST ANSWER: No, it does not. I think your magazines would have to have the BHO follower. How can I put a folding stock adapter on this? why is this pistol subject to nfa rules ? I am looking at this after it is out of stock, what is the MSRP on this pistol? It won't show till back in stock. I ran 60 rounds through it without any issues however when I field stripped to clean the gas to tube latch would not lock down no matter how hard I tried. Sent it back to PSA about 2 weeks ago and haven’t heard anything back yet, but I know they will take care of it. Seems like a minor problem but obviously I’d rather of had it resolved before it even left the factory. I hit 1,000 rounds down the barrel this morning. I have not had a single issue so far. I sighted it in at 50 yards with a sig romeo 5 red dot, and my 5 shot groups were all under an inch. That is shooting the cheapest wolf steel case ammo I could find. I also added the ALG trigger which was a very easy "drop in" process. I am loving it so far and cant wait to put more ammo through it. caught this on sell and bought before it became forever "temporarily out of stock"
psa totally redeemed themselves with this beauty. range time, field strip, and reassembly offered no failures or problems. Recived my Psak-p a few days ago. After inspecting it I noticed a few spots around the magwell where some finish was wearing off. Not a huge deal for me as it’s a budget AK and I expect things like this. However, first trip to the range the pistol would fire two rounds and the trigger would fail to reset. Called customer service and they were extremely helpful and it’s on its way back to PSA for service. I will update My review when I get it back from PSA. 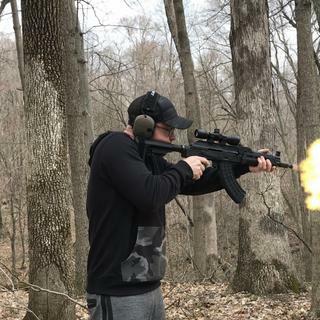 Just got back from the range with the AK-P. And I have to say, I really love this gun. it shoots soft in my opinion for an ak, but that could just be me. it cycled flawlessly once I oiled the firing pin. Everyone at the range liked it as well and i'm excited to start upgrading it. I added the ALG AK trigger with lightening bow and it's awesome. Would highly recommend. I like this pistol so far. I’ve put 500 rounds through it with only a few stove pipes. The stove pipes only a cured when I was attempting to bump fire. No bump fire, no problem. A slight burr is forming on the dust cover. I will keep you informed if it gets worse. Over all it’s a fun little gun. I would recommend getting one! 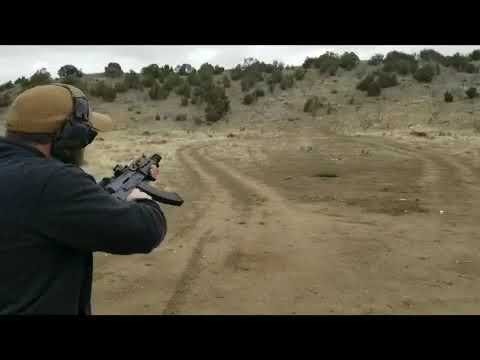 I only ran 210 rds through this firearm as I write this but I was so impressed that I felt compelled to write a review. Out of the box the fit and finish are above any AK variant I’ve seen in this price range. All the rivets are perfect, everything is nice and tight, and the attention to detail is apparent. Features like the safety lever stop and the hinged tailed top cover set this apart from the competition. The stabilizating brace is awesome. I used it in the extended position and it really felt more like a SBR than a pistol. Enough with the BS talk (lol) Let’s get down to the most important part, shooting. I ran 7, 30 rd mags through this gun with no issues. Magpul, Tapco and Bulgarian surplus mags all locked up tight and fed perfectly. The gun was zeroed at 50 yds out of the box and after 2 mags and a slight sight adjustment I was hitting 6” steel at 100yds with good consistency. I ran 2 quick mag dumps also with no issues. The front sight post is still centered so there is absolutely no canting on this gun. I closely inspected all the parts upon cleaning and everything is looking good (again I only shot 210 rds.) I will definitely put a white light and red dot on this guy in the future but I’m going to enjoy shooting it as is for a long while. I would definitely recommend buying this pistol if you get lucky and find one in stock. I think PSA hit a home run with this bad boy and I’m looking forward to running several thousand rounds through this pistol this year. Great job PSA!!! I'd been wanting an AK pistol for some time and have been reviewing all of the current models on the market. I actually probably reviewed the PSA the least, but when I saw the price and considered my previous satisfaction with PSA's offerings and customer service, I jumped on this variant. I ordered the rifle on a Tuesday and it arrived at my local FFL on Thursday. The AK-P was packaged beautifully in a sealed plastic bag and their usual foam lined cardboard box. Fit and finish was incredible for a firearm in this price range. It is a very light and comfortable pistol. I used a Magpul MOE AK magazine which locked up nice and easy, with no movement. I only had the chance to put 100 rounds of various manufacturers (Red Army Standard, Wolf, and Silver Bear) but the pistol cycled flawlessly and was center mass at 50M out of the box. One thing, this pistol is super loud! I will shoot more and use some various other magazines to test reliability and update my review, as necessary. I have high hopes for this pistol and will be ordering another if it proves reliable. So far, great job PSA!!! The AK is FLAWLESS! Built like a tank. Action is smooth as butter right out of the box. By far my favorite firearm and the iron sights were zeroed and g2g out of the box no canting issues. As mentioned the trigger pull is very light and smooth. 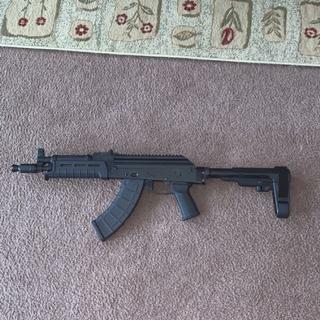 Very happy with this purchase, think PSA is about to change the AK scene here in the US. It's very early on in the testing, so take it for what it's worth. But, 100 rounds in and no issues to report. Fit and finish are flawless on my example. Really nice light trigger for an AK. Palmetto does a great job yet again. I would recommend getting one. Nice package for the price, runs smooth, so far so good. keep it up PSA! only thing i wish it came with would be a folding stock..